BBC reveals 4K UHD live streams peaked at 60,300 viewers | What Hi-Fi? The BBC says its Ultra HD World Cup and Wimbledon coverage received over 1.6m live requests in total. Last week, the BBC revealed the 2018 World Cup was the most live-streamed World Cup ever, taking a massive leap from 15.9m requests at Brazil 2014 to 56.3m this year. 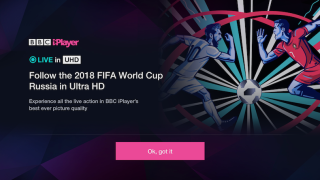 Naturally we’ve been itching to know how many 4K Ultra HD streams iPlayer (the BBC's host platform) received, and today that itch has been scratched. And, better news yet, the BBC seemed to have lived up to its promise of providing ‘tens of thousands’ of UHD streams. The Sweden v England quarter-final tie was the BBC’s highest online-viewed live programme ever, with 3.8m requests (3.9m including on-demand) on BBC iPlayer and BBC Sport, so it’s not surprising the date of that fixture (Saturday 7th July) hosted the highest peak number of UHD streams (60,300) - although the figure includes that day’s UHD Wimbledon streams too. The second-highest peak number (48,100) was for the France v Belgium quarter-final and the Wimbledon Men’s Singles fourth round matches, while the France v Croatia final and Wimbledon Men’s Singles final on Sunday 15th July clocked 44,300 UHD streams. 41,600 UHD streams ran for the Brazil v Belgium quarter-final and day five of Wimbledon, while the Belgium v Japan last 16 tie and first day of Wimbledon came in at 37,300. In total, the BBC’s Ultra HD coverage received over 1.6m live requests (compared to the 66.8m total match requests on BBC iPlayer and BBC Sport).